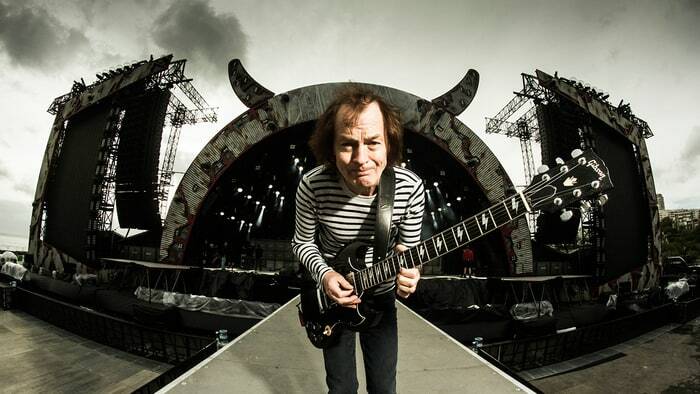 Angus McKinnon Young (born 31 March 1955) is a Scottish-Australian guitarist, best known as the co-founder, lead guitarist, songwriter and only remaining original member of the Australian hard rock band AC/DC. He is known for his energetic performances, schoolboy-uniform stage outfits and his own version of Chuck Berry's duckwalk. Young was ranked 24th in Rolling Stone magazine's 100 greatest guitarists of all-time list. With his older brother Malcolm Young's departure from the band in 2014, Angus became the only founding member still with AC/DC. Both Angus and Malcolm Young were in a band with their brother George and his music partner Harry Vanda called Marcus Hook Roll Band. the project released an album in Australia called Tales of Old Grand Daddy. Angus Young was 18 when he and older brother Malcolm formed AC/DC in 1973. Angus was on lead guitar, Malcolm on rhythm guitar, Colin Burgess on drums, Larry Van Kriedt on bass guitar and Dave Evans on vocals. "Can I Sit Next To You Girl," their first single, was later re-recorded with Bon Scott as their vocalist. They decided upon the name AC/DC after seeing the letters "AC/DC" on the back of their sister Margaret's sewing machine. Young tried a number of stage costumes, such as Spider-Man, Zorro, a gorilla, and a parody of Superman, named Super-Ang, before settling on his signature schoolboy look at the suggestion of his sister. To match this image the press and public were told that Young was born in 1959, not 1955. The original uniform was created by his sister Margaret and when it fell apart from wear and tear, he used his uniform from Ashfield Boys High School in Sydney. "I don't like to play above or below people's heads. Basically, I just like to get up in front of a crowd and rip it up." AC/DC released their debut album, High Voltage on 17 February 1975. Over the next 3 years AC/DC cemented themselves as a popular hard rock act, especially in Australia, with the follow-up albums, T.N.T., Dirty Deeds Done Dirt Cheap, Let There Be Rock and Powerage. All their albums until this point were produced by Young's brother George and Harry Vanda in partnership. Their 1979 studio album, Highway to Hell, became their best-selling at the time and launched them to new heights of fame. Months after this Scott died from alcohol poisoning. Questions were raised as to whether the band could continue without him. Young and his other bandmates soon decided they should finish the work they had begun for their new album, so they recruited ex-Geordie singer, Brian Johnson to replace Scott. Five months later, Back in Black was released as a tribute to Scott. It quickly became a huge success, far out-selling any of their previous albums, and going on to reach 22x multi-platinum in the US alone, and selling 50 million copies, the second highest-selling album worldwide, behind only Michael Jackson's Thriller. AC/DC's next album, For Those About to Rock We Salute You, cemented their position as the most popular hard rock act of the time. Soon after this AC/DC's popularity declined with the mediocre success of their next 3 albums, Flick of the Switch, Fly on the Wall and Blow Up Your Video. AC/DC looked as though they had reached their peak early in the decade and by the end of it, were in decline. Malcolm Young missed the majority of AC/DC's Blow Up Your Video World Tour to address his alcohol problem. He eventually became sober and returned to the band. During his absence he was replaced by his nephew, Stevie Young. However, their 1990 studio album, The Razors Edge, brought them back into the spotlight, reaching 5x multi-platinum in the US alone and selling between 10 and 12 million copies worldwide. Over the next 10 years AC/DC released two other studio albums, Ballbreaker and Stiff Upper Lip, which confirmed their renewed popularity and success. After a lengthy eight-year hiatus, AC/DC returned with a new studio album, Black Ice. Black Ice debuted at number 1 in 29 countries and was certified multi-platinum in 14 of those, becoming one of their most successful albums worldwide, and was followed by a hugely successful world tour. In 2010, AC/DC released an album of songs used for the Iron Man 2 soundtrack they had put together, this reached number 1 in many countries around the world, including the UK, and number 4 in the US. Malcolm Young confirmed in 2011 that AC/DC were in fact working on a 16th studio album. In April 2014 Malcolm Young was forced to leave the band due to ill health, leaving Angus the last consistent member in the band. In May it was revealed that Stevie Young, Malcolm and Angus's nephew, would stand-in for his uncle to record AC/DC's latest record. In September Malcolm officially retired and Stevie was made AC/DC's official full-time rhythm guitarist. AC/DC released Rock or Bust in the fall of 2014. In March 2016 after already seeing the departure of both long term guitarist Malcolm Young and drummer Phil Rudd, AC/DC was set back with yet another departure, long time lead singer Brian Johnson was forced to stop performing by doctors or face total hearing loss. Angus, determined to finish what the band started, recruited Guns N' Roses singer Axl Rose to stand-in for Brian for the remainder of the Rock or Bust World Tour. It is unknown what Angus has planned for the band after the tour however Axl Rose has expressed interest in staying on board for however long Angus needs him. In 2003, AC/DC were inducted into the Rock and Roll hall of fame and the following year they were ranked number 72 on Rolling Stone magazine's list of the "100 greatest artists of all time." VH1 ranked them number 23 on their list of the "100 greatest artists of all time" and number 4 in their list of the "100 greatest artists of hard rock."